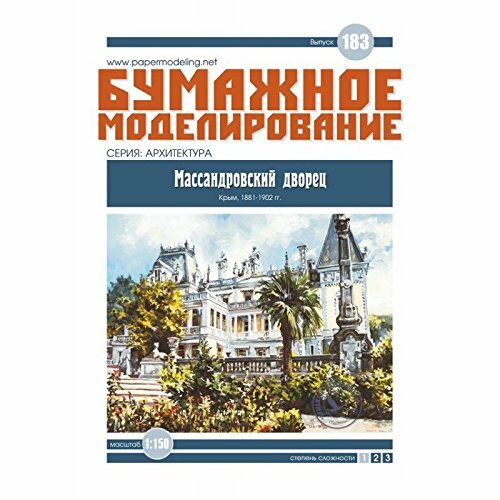 PAPER MODEL KIT ARCHITECTURE MASSANDRA PALACE OREL 183 Manufacturer: Orel (Ukraine) Scale: 1/150 Material: Paper Condition: New Number of sheets: 14 sheets of A4 Massandra Palace in Crimea (Palace of Alexander III) - one of the best monuments of architecture, which is attractive to this day. Its construction began in 1881 by order of the heir Prince SM Vorontsov, but a year later the prince died, the palace was left unfinished. In 1889 Massandra estate Vorontsov, along with the unfinished palace, bought by Emperor Alexander III. And after three years of construction it was finally completed. However, Alexander III did not have to enjoy the beauty and comfort of a new home, he died in the Small Livadia Palace in 1894. In the years of Soviet power Massandra Palace became a place of recreation party and government leaders. Palace attracts not only the amazing architecture, perfectly fit into the surrounding landscape. He is also famous for the unique originality of interior decoration. Today the palace is open to visitors, its beauty can be admired each. If you have any questions about this product by OREL, contact us by completing and submitting the form below. If you are looking for a specif part number, please include it with your message.